Mitra finished his thesis last year and for his successful defense of the thesis his colleagues gifted him among other things a Dakota Box. What is it? It is simply a gift box that offered one night stay with dinner for two persons, to choose from 360+ locations in France, Spain and Morocco. We being food lovers and my special liking for crepes and galettes and Mitra’s love for Kouign-amann, and given my preference for sea-side locations and Mitra’s wish of relaxing at a spa and sauna, we chose the spa resort of Hôtel Thalasstonic at Roscoff in the Brittany region of France. Amidst our busy schedules we managed to squeeze in 3 nights with a weekend (Saturday-Tuesday) and off we headed for our short but pleasurable vacation in Brittany. Roscoff is in the Finistere department of Brittany and like most other places in the Brittany region had been habited since the Mesolithic period and some traces of megalithic structures such as dolmens similar to the more famous Stonehenge are evidences of it. During Antiquity, Roscoff used to be one of the important ports of the Celts (called Gauls by the Romans) to interact with Carthage against the Roman colonization (much like the village of Asterix and Obelisk which coincidentally falls in the same geographic location as drawn by Goscinny and Uderzo). Much later during the medieval ages, it became a city of cohabitation between the habitants of a monastery and a fortified city to protect against the raids of the Danes. And like most cities of Brittany, the port also changed hands many times during the 100 years’ war between the British and the French. During renaissance however the very trade with the British helped the city and its port to grow and its growth being stamped with the construction of the church Notre-Dame de Croaz Vaz in 1522 and in 1550 the parliament of Brittany decided to hand over Roscoff to the parish of Minihy de Léon. 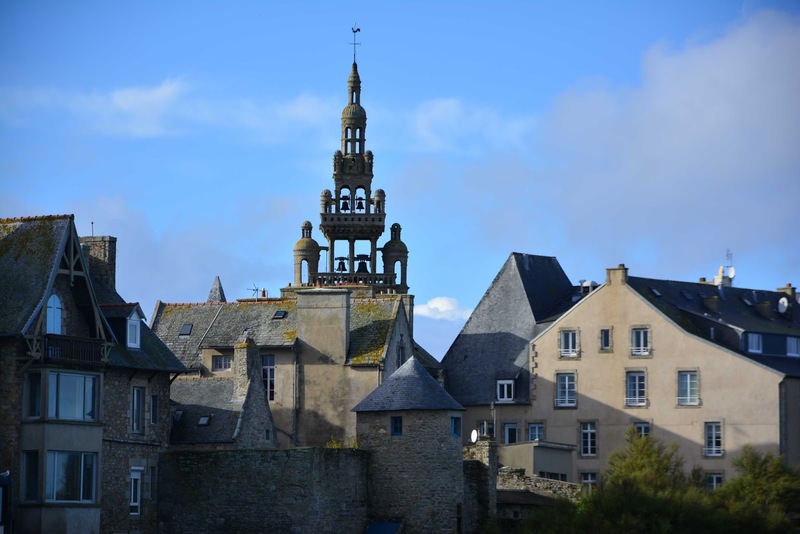 Ever since then Roscoff has maintained its place as a quaint port town of Brittany, however it has been the theatre of many naval battles being fought in the channel around Roscoff between France and Britain. One can find the detailed history of Roscoff and its monuments marked on panels at various locations in both French and English. Today Roscoff is deeply embedded in the Brittany culture and this is what I will explain in details, mainly the gastronomy of Brittany and the special onions of Roscoff. Brittany has a very typical culture which makes it unique from other parts of France, including the fact that almost all the signboards in this region are written atleast in two languages, the French and the Breton. Roscoff however is more important for its geography and mainly its unique ecology. Its foreshore, swept by tides whose tidal range can reach 10.40 m, harbors biological diversity peculiar to two ecosystems of frontier algae whose study, in 1872, is the origin of the first European pole of research, development and education in marine biology: the Roscoff Biological Station which is today a CNRS Center of Marine Biology. 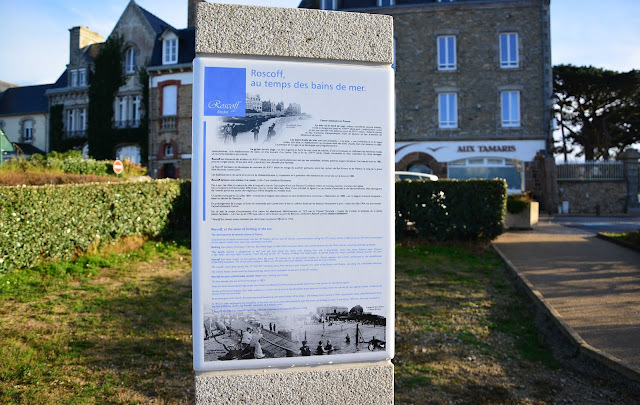 Due to the richness of iodine in the surrounding waters and the mild climate maintained by a sea current that only varies between 8 ° C and 18 °C, Roscoff is also a center of post-cure which gave rise to the concept of thalassotherapy in the latter half of the 19th century. A French doctor, Louis-Eugène Bagot opened Institut marin in Roscoff in 1899, the first center for thalassotherapy in the world. Since then many important centers of thalassotherapy such as the Institut de Rockroum (originally Institut marin), the clinic Kerléna, and a heliomarin hospital founded in 1900, the Perharidy Center can be found on the edges of the sea of Roscoff. Roscoff is accessible by train (though there are only 3-4 trains per day) or by bus from Morlaix (takes about 30 minutes), and the latter being around three and a half hours from Paris by the high speed TGV. This is how we got to Roscoff, a 3.5 hours TGV ride from Paris Montparnasse to Morlaix (540 km) and then the local TER train to Roscoff. First let me give a description of our accommodation, as I already mentioned, the gift that Mitra received from his colleagues, the stay at the apartments of Hôtel Thalasstonic. The hotel is located on the Roc'h Kroum beach and faces a small bay created by Roscoff on one side and Perharidi on the other. In fact this bay almost dries up during the low tide and water gushes in and clashes against the stone guard walls of the Hotel during high tide. The tidal shift is one of the major attractions that brings tourists to the coast of Brittany. I have of course mentioned this before and will do again later. But now for the accommodation, the Hotel has a spa and sauna facility including two indoor swimming pools and a Jacuzzi that are maintained at 31°C throughout the year. The swimming pools are enclosed by glass panes which overlook the bay and the view of the waves splashing against the wall just beyond the pool during the day is remarkable. The hotel also has an outdoor Jacuzzi with hot water flowing in it but we were of course not that brave to use it in late November. As guests of the Hotel, we had free access to the Aqua Relax Area comprising of the swimming pools, Jacuzzi, sauna and hammam (steam bath), all of which are fed by the natural sea water from the bay, the rich mineral content of which has been reputed for its therapeutic benefits since the 19th century. The Hotel also offers thalassotherapy and messages which have a supplementary price starting from around 70€. Appart from the spa, the hotel also has a sports and gym facility, a bar and a high end restaurant. The description of the restaurant is coming next. For our stay we were lodged at the apartments of the Hotel which are situated around 100m from the beach and have fully furnished studios with balconies, a perfect experience of home away from home. Now let's go back to the tidal experience, with the following video. For Roscoff as I mentioned, the main attraction is the tidal shift. Off the coast of Roscoff about 3kms away is the island Ile de Batz which measures 3.5 by 1.5 kms. 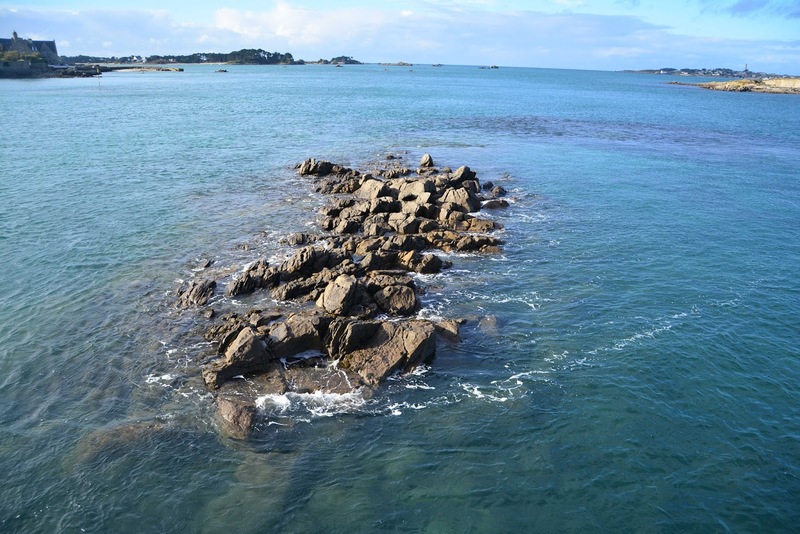 During low tide about a third of the distance between the island and Roscoff becomes dry and during high tide violent currents rage in the channel. This cycle of tides separated by roughly six hours coupled with the effect of the Gulf Stream from the Atlantic ocean and the natural barrier of Ile de Batz, allows a diversified marine life with up to 3000 different species of animals and birds and more than 700 different types of algae and seaweed can be seen washed up on the shores and the channel and bay during low tides. 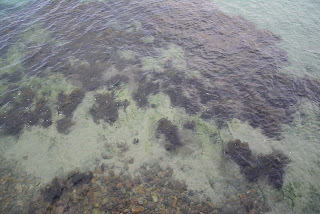 The diversity of algae found in Roscoff is the largest in Europe and its density highest in the world. Most of the algae found here being edible help a very profitable and flourishing algae trade with its center here in Roscoff. Rich in many vitamins including: A, B1, B2, B6, niacin, and C, and in iodine, potassium, iron, magnesium, and calcium, the algae found here, mainly dulse, wakamé, sea lettuce and the more famous nori are collected and then sold either to be eaten as salads or dried to be used as herbs for garnishing and cooking. We tried out some of the products at the boutique of Algoplus which can be found opposite the old port of Roscoff. Algoplus is run by Monique Poulet and Michel Perzinsky, two sea loving people who discovered the delight of seaweed and started collecting, preparing and selling them since 1993. At Algoplus the seaweed is also prepared in form of terrines (a French spreadable paste) that can eaten as bread toppings. Different cosmetics, bath soaps, beauty products based on algae and sea salts are also found in the boutique. Their factory also in Roscoff can be visited, however only in July and August. Brittany is known for strong winds and violent gusts and we were unfortunate (for the damages caused all around and more than 100,000 households without electricity for the morning of Sunday) or rather lucky to have been there in Roscoff during the passage of a storm that blew at around 160km/hour on Saturday evening and again on Monday night. In spite of the storm, the life in the town continued as normal the day after. The main boutiques and restaurants of Roscoff are on the promenade along the coast extending from the towering church, Notre Dame de Croaz Batz and town hall in the west to the lighthouse and the old port in the east. The church was constructed as a show of prosperity of the ship owners of the 16th century and three stone ships on the façade are symbols of those ship-owners as the principal donors in its construction. The narrow alley from the church leading up to the light house is flanked by buildings with the typical Breton architecture, most of them being old storehouses of the merchants, have a hatch on the pavement that leads into the cave where the merchandise was stored in the past. Close to the old port is the remnants of a 16th century fortification built to protect the city from the raids of the Danes and the British and just beyond is a pier around 600m long that leads into the sea. It is the boarding point for Ile de Batz during low tide. Vehicles are restricted on it since 2011 but are still accessible on foot, with a renovation work due in 2017. The walk across it is interesting both during high and low tides. During high tide the water below is clear, transparent and colorless and thus reflects the sky in its totality. When we walked on it, the sky was overcast and the reflection of it gave a mystic appearance to the sea around and below us. During low tide, the sea bed below the pier almost dries up and one can explore the rich biodiversity of the bed below. From the pier the panoramic view of Roscoff and Ile de Batz is marvelous and thus should not be missed. Now let me come to another important attraction of our trip, the gastronomy of the Brittany region. First the most famous product of Roscoff, for which it is known all over France, the special flavorsome and slightly sweet onions of Roscoff, now an AOC approved label in France. These onions cultivated in the area from the 17th century became famous in the 1800s owing to the onion sellers called the Johnnies who sailed far and wide to promote their special onions. 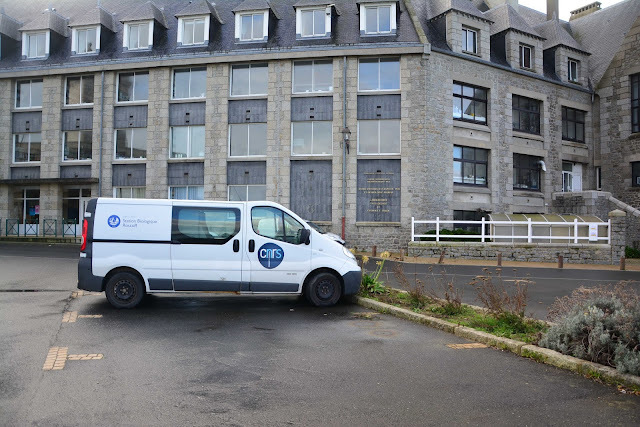 A museum dedicated to the Johnnies of Roscoff can be found just beside the train station and is open from February to September with a festival in August. This is something one must be careful about while visiting Roscoff: Most of the museums or even restaurants and boutiques are closed in the low season from October to February (you may well find “closed for vacation” or “off on leave” signs on most doors). However visiting in winter can have its advantage, making the city free of the rush of tourists and thus more tranquil and serene, the tides are rougher and more impressive and of course the best of the sea food and fish can be found during this time. For the sea food, we tried the oysters at the restaurant of Hôtel Thalasstonic and of course as expected they were fresh and perfect appetizers to start our dinner. The dinner for the first night of our stay was included in the Dakota box and it was a take away four course platter. We also dined at the restaurant on Monday evening. Mitra took a crab farce (tourteau in French) while I tried a lobster soup (Bisque de langoustines) for starters. For the main dish I tasted the fresh catch of European hake and it was truly delicious. The dish was served with artichokes which are widely grown in this region and in fact there is an artichoke farm just a few meters from the hotel. In fact the restaurant is perfect for a nice dinner, with a view overlooking the bay (of course the view is better during the day and completely dark at night) and quality food. A complete sea food platter is also available at the restaurant; however a pre booking of 48 hours must be done for it. It was here that we also came across a special cheese from Brittany, the Timanoix, which is walnut flavored cow milk cheese, and I may say it is now added to the list of my favorite cheese. Now let me come to the specialty of Brittany, its galettes and crepes. You can find details about it in my previous blogs. I tried them out at the restaurant Les Amours Jaunes and they were undoubtedly delicious. They were probably one of the best I have tasted. A true delight of Brittany and tasted in its absolute grandeur in Brittany. We tired the galettes with Andouille de Guémené (pork chaudin sausage) and Brittany sausages, and they were absolutely delicious. For the crepes I opted for one with salted butter caramel (commonly called Salidou) which is another Brittany speciality. Apart from tasting them, I also got myself the special flour, Ble noir (Sarrasin or buckwheat) and also that for crepes (Farine de froment) from a well-known bakery of Roscoff, the Boulangerie Guillou. The lady of the bakery also gave me ideas, tips and tricks of perfectly using the flour in typical Breton style and with it handed me some traditional recipes of crepes, galettes and another typical Breton dish, the Kig ha farz. Well, you can expect some recipes to come soon on my blog. And now for another delight of Brittany, the kouign amann. It is a cake made with yeast-leavened dough and layers of butter and sugar folded in. It originated in the Finistere department of Brittany, the same as Roscoff in the 1860s when an acute shortage of flour and abundance of dairy products made the bakers use flour, butter and sugar in the same proportions while baking their breads. This idea is said to be invented by a baker Yves-René Scordia however it soon spread throughout the Brittany region and thus the delicious sweet caramelized buttery cake was born. I tried the Kouign amann in at least 4 different confectioneries (boulangerie in French) in Roscoff and for me the best was that of the Boulangerie Guillou, however I can advise you to try them out at the first bakery that you see here, they are really that delicious. There is also La Maison Du Kouign Amann, which boasts of the best of the region, however given the low tourist season it was closed for vacations like some other boutiques that I mentioned before. Another special dessert of Brittany is the Far Breton which is a flan style custard cake with prunes. I tried them out as well but my favorite still remains the Kouign amann. Now let us come to the drinks. The main drink of Brittany is the cider. 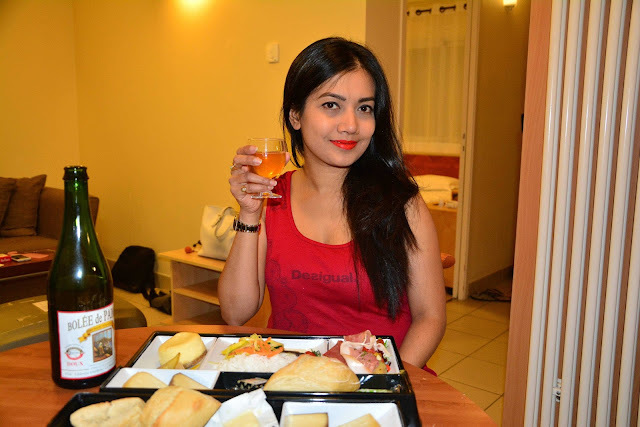 I personally prefer the Cidre Doux (sweet) and we tried quite a few of them during our stay in Roscoff. I must say that I liked all the Cidre Doux that I tasted during my trip but the best was Boulée de Paimpol which comes from a coastal region a bit eastwards from Roscoff. Another favorite drink here is the Kir Breton. In general Kir is a French cocktail made with a strong liquor diluted with white wine or any other fizzy drink. The Kir Breton is made with cider as the diluting liquid. 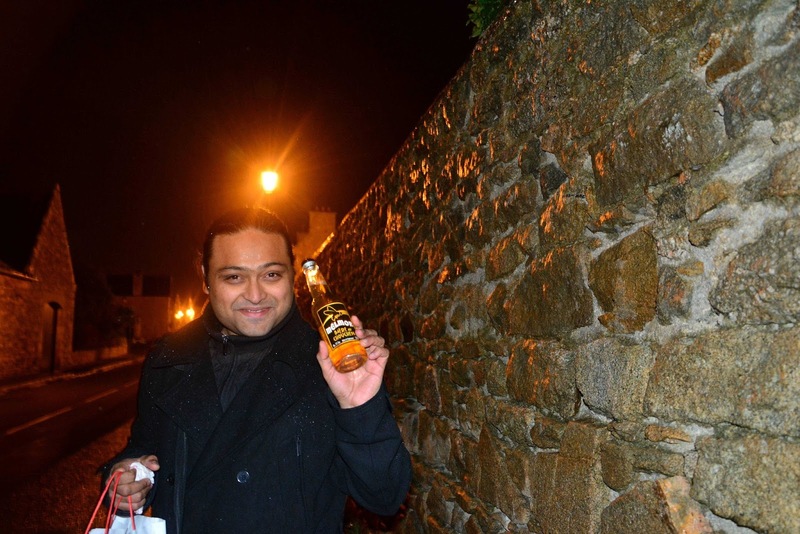 Sometimes the Kir Breton is made with a honey based liquor of the Brittany region called the Chouchen. I tried both the Chouchen and the Kir Breton with blackberry liquor and I preferred the Chouchen and it also brings a uniqueness in its taste and a Breton touch with it. Most of the information about Chouchen and other Breton drinks such as the Lambig was given by the shopkeeper of La Trinitaine, a boutique close to the port. It was from here that I got myself some other special Breton goodies such as algae flavored pasta, dried algae for cooking, onions of Roscoff, crunchy galettes and assortments of Breton cookies. Brittany is also known for its beer and has a long beer brewing tradition, tracing its roots back to the seventeenth century. I am not a beer lover though but I tasted a beer based on chouchen which I found quite interesting. After four days of immerging our selves in the culture and gastronomy of Brittany, in the warm sea-waters of the swimming pools and the steam of the sauna, and after hours of contemplation looking out on the ever shifting and rolling sea, I feel myself to be refreshed and ready to take on my daily life and this blog again.